Type I (fine). 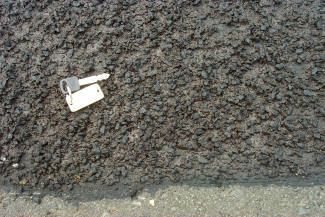 This type has the finest aggregate gradation (most are smaller than the 2.36 mm (No. 8) sieve) and is used to fill small surface cracks and provide a thin covering on the existing pavement. Type I aggregate slurries are sometimes used as a preparatory treatment for HMA overlays or surface treatments. Type I aggregate slurries are generally limited to low traffic areas (ISSA, 2001a). Type II (general). This type is coarser than a Type I aggregate slurry (it has a maximum aggregate size of 6.4 mm (0.25 inches)) and is used to (1) treat existing pavement that exhibits moderate to severe raveling due to aging or (2) to improve skid resistance. Type II aggregate slurry is the most common type. Type III (coarse). This type has the most coarse gradation and is used to treat severe surface defects. 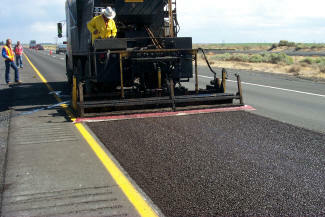 Because of its aggregate size, it can be used to fill slight depressions to prevent water ponding and reduce the probability of vehicle hydroplaning. 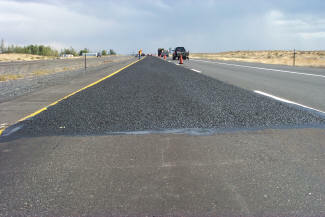 Microsurfacing is an advanced form of slurry seal that uses the same basic ingredients (emulsified asphalt, water, fine aggregate and mineral filler) and combines them with advanced polymer additives. Figures 1 through 4 show a microsurfacing slurry seal project. Figure 1: Ignition method major equipment. Preventive maintenance. Repair slight to moderate pavement surface defects, improve skid resistance. 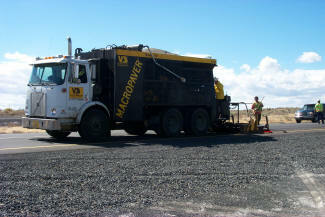 Emulsified asphalt, water, well-graded fine aggregate and mineral filler. As opposed to a fog seal, a slurry seal contains aggregate and can thus correct minor surface defects in a variably textured surface – filling cracks and voids, sealing weather-tight, and providing color and texture delineation in a single pass (ISSA, 2001b).